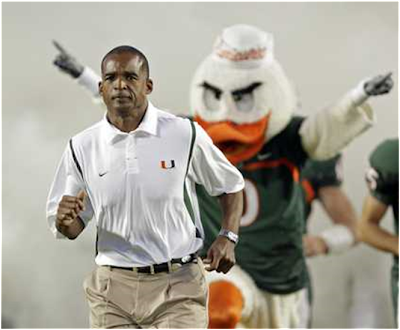 Miami (Fla.) football coach Randy Shannon has signed a new four-year contract that goes into effect this coming season. "This is an important contract for us," President Donna Shalala told USA TODAY Wednesday night. "We believe that Randy Shannon will get us back to where we belong, competing for a national championship year after year." The Hurricanes, who went 9-4 in 2009, last won the national title in 2001. Shannon, 44, took over in 2007 and has led Miami to two bowls. Last fall, the Hurricanes defeated three top-25 teams and played in the Champs Sports Bowl. "We are very proud of the positive steps our football program has taken under the leadership of Coach Shannon," Miami athletics director Kirby Hocutt said in a news release. "With a commitment to excellence in the classroom, in the community, and in competition, we are well on our way, once again, to the top of the college football world." Salary numbers were not released. "There's no other place I'd rather be than coaching Hurricanes football," Shannon said in the release. "I'm excited about the momentum we continue to build." Miami's team also has been recognized for a strong performance in the NCAA Academic Progress Rate (APR), which combines graduation and retention numbers. Under Shannon, the team has been in the top 10% of major college programs. "Randy has done it all," said Shalala.